WASHINGTON- NASA has ordered some last-minute tests on the space shuttle Discovery?s giantfuel tank to see if the spacecraft is safe to blast off later this month. Discoveryis slated to launch toward the International Space Station on Aug. 24, but onlyif its fuel tank passes new round of pull tests to make sure that foaminsulation in certain areas won?tpeel off and damage the orbiter during launch, mission managers said Thursday.An Aug. 24 launch would lift off at about 2 a.m. EDT (0600 GMT), if approved. NASAshuttle program manager John Shannon said engineers this weekend will pullsamples from part of the 15-story tank called the ?intertank? - a ribbed,barrel-like area just above the mid-point of the tank. An unusually high amountof foam fell from a similar area during the launch of the shuttle Endeavourlast month and NASA is not sure why. After Endeavour's launch, engineers performed an initial round of pull tests on the backside of Discovery's tank and found the foam insulation in good health. The new tests will check regions on the front of the tank to be sure foam there won't pop free and damage Discovery, Shannon said. Engineersare also using a special X-ray machine to scan a series of ice-frostramps, essentially foam-covered brackets, on the next shuttle fuel tank to flyafter Discovery?s current mission. Some foam popped off a similar ice-frostramp during Endeavour?s launch and NASA wants to be sure there are no generic flaws with the fuel tanks before clearing Discovery for flight. ?We have alot of confidence that we?re in good shape,? Shannon told reporters Thursday.Aside from the extra fuel tank tests, Discovery is in fine shape for itsplanned launch later this month, he added. NASA haskept a close watch on foam debris during shuttle launches since a piece of foampunched a hole in the wing-mounted heat shield of the shuttle Columbia, leadingto its destruction in 2003. 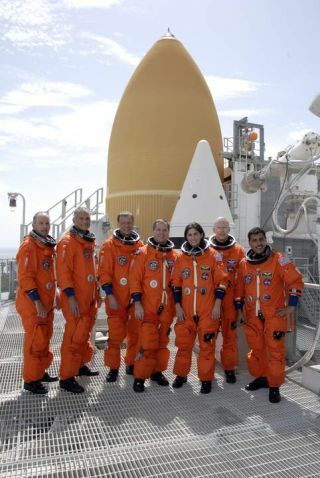 Sevenastronauts were killed in the disaster. Shannon andother top NASA officials will review the results from this weekend?s fuel tanktests next week during a standard flight readiness review meeting. By then, missionmanagers should know whether Discovery can fly as is or be hauled back insideNASA?s cavernous Vehicle Assembly Building at the Kennedy Space Center inFlorida for repairs. If anyrepairs are needed, they could delay Discovery?s flight beyond its Augustwindow to mid-September or Oct. 17, Shannon said. NASA hopesto launch Discovery by the end of August in order to fly the mission before theplanned Sept. 10 launch of Japan?s first unmanned cargo ship to deliversupplies to the space station. A Russian unmannedcargo ship is also due to depart the station next month to set the stage forthe arrival of a Soyuz spacecraft carrying new crewmembers and space tourist tothe station. That Soyuz is slated to launch Sept. 30, adding more space trafficto the mix. ?So it?s a reallybusy time for the International Space Station,? said Kirk Shireman, NASA?sdeputy space station program manager. Discoveryis slated to launch seven astronauts on a 13-day mission to the InternationalSpace Station to replace one member of the outpost?s crew and deliver vital suppliesand new equipment to the orbiting laboratory. The shuttle will carry a cargopod packed with new science racks, fresh food, a new astronaut sleeping berthand a treadmill named COLBERT in honor of American comedian Stephen Colbert. Threespacewalks are also planned during the mission to perform station maintenanceand replace a massive ammonia tank for the station?s cooling system. The tankweighs as much as a small car and will require two spacewalks to replace. ?It?s a bigflight to fully utilize the InternationalSpace Station,? Shireman said. The missionis only the second time in history that 13 people, seven from Discovery and thestation?s core six-person crew, will be aboard the orbiting laboratory at thesame time. Aside from a broken American-built oxygen generator, whichastronauts are expected to fix in the next few weeks, the station is ready forits second shuttle visit in two months, Shireman said. Veteranshuttle commander Rick Sturckow will lead the mission, which will replace NASAastronaut Tim Kopra aboard the station with fellow American astronaut NicoleStott. Discovery?sflight will mark NASA?s fourth shuttle mission of up to five planned for thisyear. NASA plans to launch seven more shuttle missions, including Discovery?s,to complete spacestation construction by 2010, when the aging three-shuttle fleet is slatedto retire. Ablue-ribbon panel appointed by the White House is currently reviewing NASA?splan to retire the shuttles by 2010 and replace them with new spacecraft aimedat returning astronautsto the moon by 2020. One of the proposals reviewed by the committee callsfor a more heavily shuttle-derived vehicle and extending shuttle missions forseveral years beyond 2011. Shannonsaid any decision to continue flying the space shuttle beyond the final seven missions,even at a rate of one to two shuttle flights per year, must be made byPresident Barack Obama?s administration before the end of this year. NASAcurrently plans to lay off some 1,200 people - 10 percent of the shuttleworkforce - and would have to renew some contracts since the last external tankand shuttle main engine test, for example, have already been performed. ?We?regetting to the point, if we don?t have a decision late this year, we?re goingto end up having a gap between when we would stop flying the flights that arecurrently on the manifest and any new flights that would be out there,? Shannonsaid. ?So it?s getting very late in the game for us. ?